From the 22nd of October blue is the colour. Aranya Craft Ltd on Kemal Ataturk will be hosting an exhibition in celebration and for the promotion of neel, otherwise known as indigo. 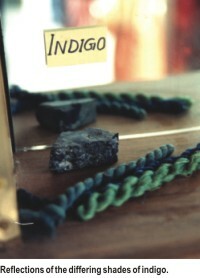 Until 20 years ago, the cultivation of indigo had died out. The actual word 'indigo' in fact stems from the Ancient Greek derivation of the Indian word Indikos, meaning 'from the Indus River'. 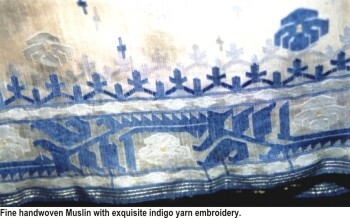 The Greeks, although they traded with India, did not use indigo extensively. This was left to their future counterparts, the European traders of the seventeenth century who gave it a place of honour among their exports. They also dealt with indigo from India but shifted their attention to the superior dye makers of Bengal, in particular from the Jessore and Nadia districts. The traders encouraged farmers, often with brutality, to grow the magical plant. In the event of a crop failure farmers were indebted to the Europeans who, in short, held a monopoly over this particular branch of agriculture. They maintained this level of debt as a way of forcing farmers to continue the cultivation of the blue plant and, what is more, sell their produce at unfairly low prices. 1959 saw the 'Blue Mutiny'. Farmers were tired of unjust treatment and refused to grow indigo preferring instead to grow rice so that they could at least feed their families. The revolt was supported by the educated and elite classes of Bengal and the British government proceeded to make legislations in favour of the protection of farmers from enforced cultivation of the plant. Successful as this was for the, by now impoverished, farmers of Bengal, combined with the development of industry around the world and, in 1897 the discovery of German aniline dyes, the use of natural dyes, indigo or otherwise, was eventually eradicated. In 1982 Ruby Ghuznavi, on behalf of the Vegetable Dye Society, began looking for natural dyes in Bangladesh. She discovered many derelict and long forgotten indigo vats but no dyers and her inquiries were met with hostility. Clearly the bloody saga of the indigo farmers had become dyed-in-the-wool. Ruby now works closely with Mennonite Central Committee, an international NGO who now have a well developed agriculture program in Bangladesh but who began researching the cultivation of the indigo plant in order to create sustainable employment for the rural poor. From seed to beautiful blue scarves, the process of extraction of indigo is by no means one to be taken lightly and can take months. Indeed the final dying process is something of alchemy as the indigo colour only develops on contact with oxygen. Because it is a time consuming and labour intensive operation, indigo comes at a certain price. However, it is still preferable to have indigo made authentically by many smaller establishments rather than centralised in one huge co-operative. As such indigo cultivation also has the advantage of providing employment and gives workers the opportunity to learn a traditional craft of Bangladesh which has long since been eradicated. Indigo is a friendly plant--an eco-friendly plant, that is. Spent leaves from the extraction process can be re-used as fertiliser and its impact of the land in which it grows is such that it can be cultivated between other crops to revitalise the soil and make it even more arable. Although 80% of Aranya's customers are from Bangladesh it is important that people here realise how beneficial indigo is. Aranya already benefits from a huge export revenue extending from Japan to Europe to America and even boasts some very well known companies as clients. There is a huge market for indigo - people like blue. But as Pushpa Rozario, production manager of Aranya, not many people instantly like the subtle hues that Aranya produce. "Our colours are much lighter than chemical dyes but once people buy something from us, they always come back". Colours at Aranya are the real McCoy. It is with this push for the recognition of indigo in mind that Aranya is holding its exhibition in conjunction with MCC. Exhibited items will, it goes without saying, be for sale and include a wealth of items to decorate both yourselves and your homes. Anything from silk sarees to fine, muslin scarves and cotton cushion covers, to skirts, mens' punjabis and dressing gowns can be found in a variety of shades of blue. Of course all items are hand made and are available with or without exquisite details such as printed geometric patterns, waxed patterns or painstakingly worked embroidery. Even if blue is not your colour Aranya is definitely worth a visit for its rainbow of other natural colours from jet blacks to burnt pinks to ocherous yellows. The choice is yours. The exhibition will run from 22nd October to 15th November subject to Eid-ul-Fitr and Aranya's products will also be available form Kumundi, Prabortora, Shllaikon, Tangail kutir, Bonoz Barndi and Ayon.